Location: A.D.O. teams practice at Ta-Ha-Zouka Park and the new Krejci Soccer Complex (4701 N 230th Street). For additional questions regarding the A.D.O. Program, please contact Keith Reid, kjreid1994@gmail.com. A.D.O. teams will compete in the ENSA League, which will determine the game schedule. Training days and times will be set after the coaches meeting on July 30. New uniforms are to be purchased at Soccer Internationale, which is located at 132nd and West Center Road. 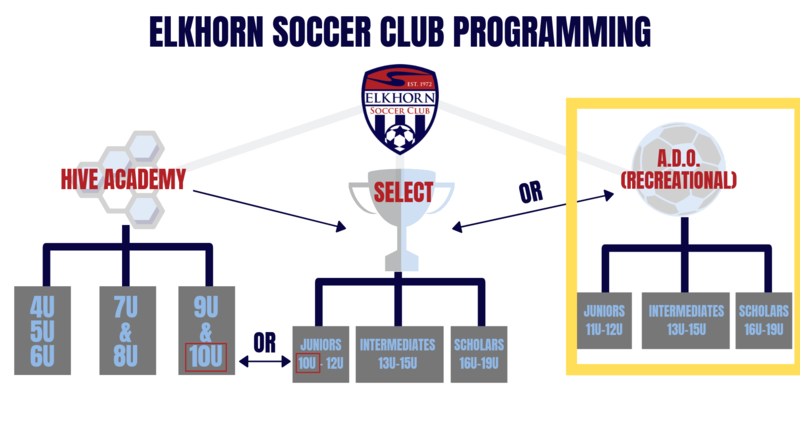 Let the staff know that you're an Elkhorn SC A.D.O. player and they will get you the appropriate kit. All players are required to have a soccer ball* (11U-12U size 4, 13U and older size 5), shinguards, and soccer cleats*. Soccer cleats do not have a cleat on the toe of the shoe and it is dangerous to wear shoes that have them. *We encourage and prefer all players buy adidas soccer products!